Ranchview Floral, a floral shop in Overland Park, well, OK, not just a floral shop, they have bazillion other things too like cards to go with the flowers, cute books, and lots of great gift items. I wanted to perk up my wife’s spirits ( I don’t remember what I did, but it was definately my fault ). So I stopped by the florist at 95th and Nall. The new shipment had just arrived, so they were incredibly fresh flowers. 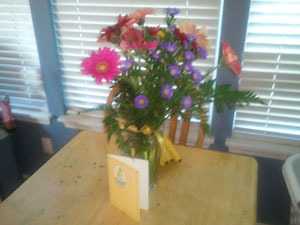 I asked for some Gerbera daisies (thats Gerbera not Gerber – thank you spell check) and was impressed with how many I got. My lovely wife was too. As I was waiting for the arrangement to be finished, I browsed the store. Tons of interior furnishings. I have been in real estate for almost 16 years and finally discovered where some of the top decorators get their stuff. Honey, if you read this, the desk I want is in the lower level towards the south wall. They had to wipe my drool off it. 🙂 If you have browsed the local new home subdivisions and builder models you will recognize the quality items here. There was a nice selection of cards, Hallmark and others, I think. I got one with a turtle saying ‘sorry if I snapped’. And a book of funny mom-style quotations. My lovely wife was happy and thus, so was I. 3885 West 95th Street in Overland Park KS. Its located in the Ranch Mart South shoppin center on the South East side of Nall and Mission Road. p.s. We left on vacaction 4 days after and the flower were still beatiful so we had Mom-in-law take them home with her. Double duty good hubby points!